The most important step in any skin care regime is to cleanse your skin properly. Start your skin care ritual by cleansing your face, so as to remove excess oil, dust and pollution that block your skin pores. Everyday your skin is exposed to dirt, perspiration, dust, bacteria, sun, and harsh wind, which rob your skin of its luster and make it prone to many skin diseases. That is why proper cleansing becomes the most important part of your daily skin care routine. If you don’t cleanse your skin properly, it will get clogged with impurities leading to many skin issues, such as blemishes, acne, pimples, age spots, wrinkles, itching, and so on. Otherwise also removing make-up and dirt before going to bed at night is an important part of skin care routine and here comes the role of a good facial cleanser. The market is flooded with many facial cleansers, and most of them claim to cleanse your skin from deep within. But why spend money on them when you can make your own homemade facial cleanser with natural ingredients easily at home. Try these amazing recipes for making your own easy natural facial cleansers at home that are suitable for different types of skin. 1. Milk, Almonds, Lemon Juice Generic Cleanser For All Skin Types: Ground almonds of about 1/8th cup and mix it thoroughly with 2 tablespoons of milk/cream and 1 teaspoon of lemon juice. Use this mixture to cleanse your skin gently. Rinse it off with warm water. 2. Raw Milk – A Generic Cleanser For All Skin Types: Take un-boiled raw milk in a bowl. Dip a cotton ball or pad in the milk and dab it over your face, forehead and neck to wipe off all the dirt. Let it dry and dab it again few more times. Wait for some time and then wash it off to have a baby like soft skin feel. 3. Natural Rosewater Cleanser For All Types Of Skin: Rosewater is the simplest and effective natural remedy to cleanse your face. You can apply it every night before you go to your bed to get glowing skin. 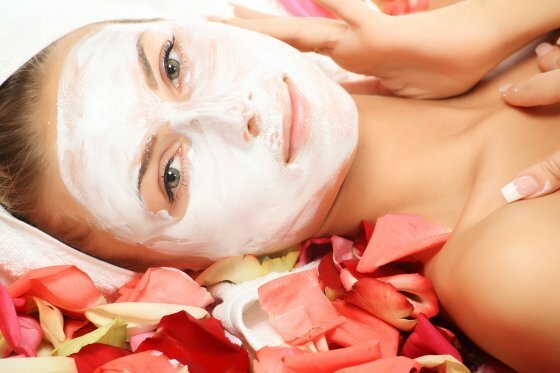 Dip a cotton ball in rosewater and wipe off all the dirt accumulated over your face, forehead and neck to get rid of skin problems. 4. Cucumber Cleanser For Normal Skin: Grate one cucumber and rub it onto your skin in circular motions. This acts as a very good natural cleanser and toner. Alternatively, you can also apply its juice. Mix 1 tablespoon of cucumber juice with 1 teaspoon of plain yogurt/curd. Rub this mixture onto your face, forehead, and neck. Let it sit for 5 minutes and wash it off with cool water. It cleanses as well as nourishes your skin. Tip- You can mix oatmeal in to this cleanser to exfoliate your face as well. 5. Yogurt And Honey Cleanser For Dry Skin: Yogurt acts as an effective natural cleanser for dry skin. Mix 1 tablespoon of plain yogurt and 1 teaspoon of honey. Apply it on your face, forehead and neck and cleanse your skin. Let it sit for 2 minutes and then rinse it off with cool water. 6. Cucumber, Yogurt And Oatmeal Dry Skin Cleanser: Mix thoroughly 1/4th of a crushed cucumber, 2 tablespoons of plain yogurt, and 2 tablespoons of cooked oatmeal in a bowl. Use this mixture to wash your face and neck. 7. Honey, Egg Yolk And Almond Cleanser For Dry Skin: Beat yolk of 1 egg and mix with it thoroughly 1 tablespoon of honey and 5 to 7 ground almonds. Mix well and apply it all over your face, forehead and neck. Let it dry and then rinse it off with lukewarm water. 8. Only Honey : Honey acts as an excellent natural cleansing agent, as well as it keeps your skin hydrated and smooth. Mix half a spoon of honey with water to thin it out. Apply this directly on to your face, forehead and neck and rinse it off with lukewarm water after 10-15 minutes. This works as a gentle cleanser and decreases oil secretion and breakouts. If you have dry skin, mix milk instead of water and those having oily skin can mix lemon juice with honey. 9. Moisturizing Natural Honey Face Wash: Mix well in a bowl 1 tablespoon of honey, 1 tablespoon of oat/rice bran and 1 tablespoon of milk/cream. Heat the mixture a little in a microwave and stir it until it gets well blended. Use this mixture as a natural face wash while it’s still warm. 10. Stimulating Natural Face Cleanser: Put 1 ripe tomato, 2 tablespoons of milk and 2 tablespoons of citrus juice (lemon, lime or orange) in a food processor. Blend the ingredients until they transform into a smooth mixture. Use this mixture to wash your face. Keep the leftover mixture into your refrigerator and you can use it up to a couple of weeks. 11. Skin Lightening Organic Face Cleanser: Take orange peel powder and raw un-boiled milk. Mix them well together and scrub on your face to deep cleanse and brighten your skin tone. 12. Revitalizing Homemade Face Wash: Take 1 slice of peeled apple, 2 tablespoons of plain yogurt, 1 teaspoon of olive oil and 1 teaspoon of citrus juice (lemon, lime or orange) and blend these natural ingredients together in a food processor until they get smooth. Use this mixture to wash your face, forehead and neck. Keep the leftover mixture into your refrigerator and you can use it up to 3 days. 13. Vitamin A And Vitamin E Homemade Skin Cleanser: Mix 1 tablespoon of honey with half cup of water. Open 1 capsule of vitamin A and vitamin E each. Mix them into the solution thoroughly. Apply immediately over your face, forehead and neck. Wash it off your face after two minutes. 14. Moisturizing Natural Cleanser: Take 2 tablespoons of olive oil, 4-5 grapes and 1 teaspoon of raw un-boiled milk. Put these ingredients in a food processor and mix them well. Wash your face with this homemade mixture. 15. Heal And Protect Natural Cleanser: Take 1 big peeled aloe-vera leaf, 1 small peeled slice of papaya, 1 table spoon of honey and 1 teaspoon of plain yogurt. Blend these ingredients thoroughly in a food processor until smooth. Wash your face, forehead and neck with it. 16. Natural Cleanser For Oily Skin: Mash grapes and mix them with lemon juice. Beat yolk of one egg and combine it with the mixture thoroughly. Apply this homemade cleanser recipe on your face, forehead and neck. A natural cleanser to cleanse oily skin. 17. Natural Exfoliating Face Wash: Take a pinch of sugar, 1 tablespoon of honey, 2 tablespoons of aloe-vera gel, and mix the ingredients with a fork. Rub your face with this mixture and rinse it of after 10 minutes. Keep the leftover in your refrigerator for use up to a couple of weeks. 18. Baking Soda Face Cleanser: Mix 2 teaspoons of baking soda with I table spoon of warm water to formulate a homemade face cleansing paste. Rinse your face with lukewarm water and then apply this mixture onto your face, while massaging it in circular motions. Wash it off after few minutes. 19. Baking Soda and Jojoba Oil Cleanser: Another easy and quick natural facial cleanser recipe is by mixing baking soda with jojoba oil and adding any other essential oil of your choice. Different essential oils provide you with different benefits. Whereas chamomile essential oil acts as a good anti-inflammatory agent, tea tree oil has acne fighting properties. Lavender and eucalyptus oils have antibacterial properties. To cleanse your face, take a little of the baking soda, add a few drops of jojoba oil, and a couple of drops of the other essential oil of your choice. More adventurous types can add a little bit of honey and mix well. Massage this mixture on your damp face in circular motions with your fingers and wash it off with lukewarm water after a few minutes. This multi-purpose homemade organic cleanser will improve your skin tone, decrease blemishes and acne and endow you with clear skin. (i) To ensure a deep cleansing of clogging debris from the skin pores, use circular motions to gently rub the skin. This will make your skin deep clean, soft and agile. (ii) Never wipe your face, as this will eventually stretch your skin tissues leading to sagging skin, fine lines and wrinkles over time. (iv) To make the most of using a natural cleanser, rub your homemade cleanser recipe onto warm moist skin. (v) Always select natural ingredients, which are fresh and fully ripe. We have now shared with you the best homemade facial cleansers that you can make out of the natural ingredients available in your kitchen. What are you waiting for? Go to your kitchen and try any of the above wonderful recipe of your choice for natural face cleansers right now. And be all set to showcase your squeaky-clean skin that will shine like a star!!!! Separator image Posted in Beauty, Health, Lifestyle.